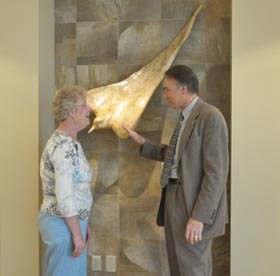 Karen Lindhorst and Chaplin Rippe in front of "Prayer"
After years of planning, the McKee Medical Center Chapel was dedicated on April 15. 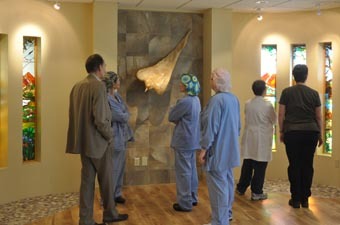 Many of the hospital staff took the opportunity to stop by and see the finished product. Hospital Chaplin Bruce Rippe said he was very actively involved with the process of designing this space. He wanted a place that was spiritual, where people could meditate without the space having an overly religious tone. “What better way to do that than bring in the natural world,” he said. The aspen grove wall is a great part of the effect that Rippe wished to achieve. These unique windows were created by Ed Lucia of Lucia’s Leatherwood glass. The two panels of etched glass are mounted with a space between, giving a three dimensional effect to the wall. The aspen look so life like that most of the visitors to the chapel wanted to touch the window wall to see if they can feel the texture of the tree bark. The other centerpiece of the chapel is the wood sculpture “Prayer.” By J. Christopher White, whose trade name “Parables in Wood,” seems like an apt description of this half smoke-half dove creation. The sculpture is centered on the wall between the two stained glass windows at the front of chapel. The flowing upper end of the piece represents a prayer being sent to heaven, the dove represents the answer to the prayer. 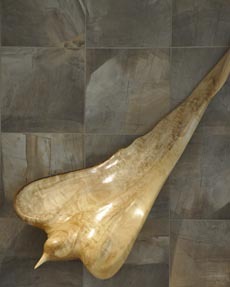 As is his custom, White will create a poem to accompany the sculpture. It would appear that Rippe has achieved his coal in this extraordinary space. He certainly seemed pleased the day of the dedication. He was also happy that the renovation includes a new location for the Chaplin’s office; it now will adjoin the chapel. Many McKee employees took the opportunity to visit the new chapel. 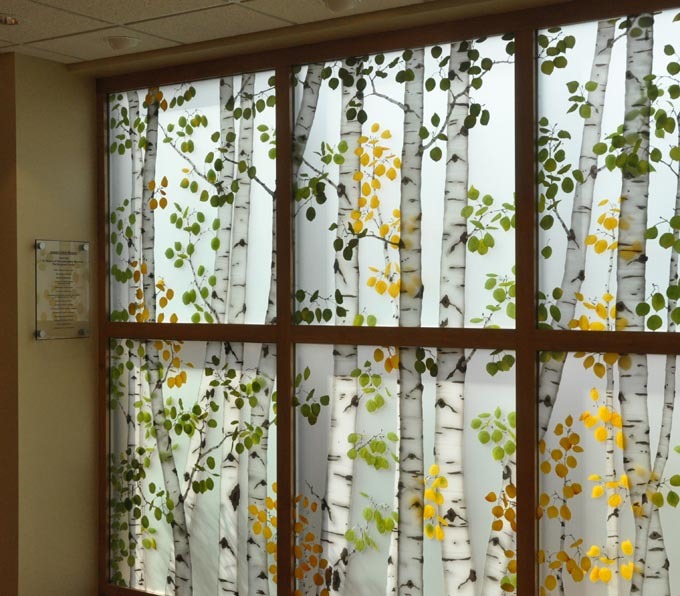 The aspen wall brings the natural world into the chapel. Site contents copyright © 2019 Recorder Online	except as noted. All rights reserved. | 89 queries in 2.154 seconds.